Plan is individually scaled so it can be reused before every GAFB and always meet your fitness level. 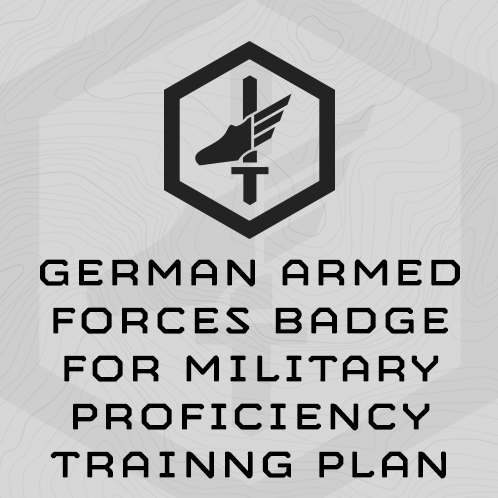 The following 4-week training plan is designed to train specifically for the German Armed Forces Badge for Military Proficiency (GAFB). It is an assessment based training program which uses your latest GAFB event results for the follow-on progressions. In this way, the program automatically “scales” to the incoming fitness of each individual athlete, and ensures that each athlete is pushed throughout the program. This plan was published in August 2018. You perform 52 sec. on SESSION 1 BFT Flexed Arm Hang. Your SESSION 1 BFT Flexed Arm Hang Time was 52 seconds. 40% of 52 seconds is .4 x 52 = 20.8 or 21 seconds (round up). The other progressions work in the same way. The program uses the MTI Running Calculator for your runs. These paces are based on your assessment results. Always use the latest assessment results to determine paces for subsequent training sessions. The pace for these intervals is faster than your assessment pace – you’ll be pushed. Can’t make the prescribed pace? Try harder. If that doesn’t work – run each as fast as possible, but still, take the full rest between efforts. Running area (track or other) with known 400m and 1000m distances. Comments: See Here and Here for a description and video of the BFT events tested above. (1) Swim 100m in ABUs, ACUs or BDUs, then take off uniform in the pool without touching the side or bottom. (2) Ruck 12km for Time wearing military uniform, boots, and carrying a 33-pound (15kg) rucksack. Set up two cones as per the GAFB BFT 11x10m Sprint Test guidelines. On go, complete as many round trips as possible in 3 minutes, dropping to prone at the start cone every rep. Rest as needed, but keep working the full 3 minutes. Run 400m at your "400m Interval Pace" using your SESSION 1 BFT 1,000m Run Time and the MTI Running Calculator. Uniform: Military Uniform (ACUs, ABUs, BDUs) and boots, plus a 33-pound rucksack. 10m GAFB BFT Sprint Round Trips at your "Interval Pace"
How to calculate your "Interval Pace": Take your Max Rep Round Trips from SESSION 3's 3-minute sprint assessment, divide by 3 and multiply by 1.2. For example, your SESSION 3 Max Rep Round Trips in 3 Minutes was 45. 45 / 3 = 15. 15 x 1.2 = 18. 18 Round Trips is your "interval pace"
Set a repeating countdown Timer for 120 seconds. On go, complete 18 round trips as fast as possible. The faster you finish, the more rest you get before the next round starts.